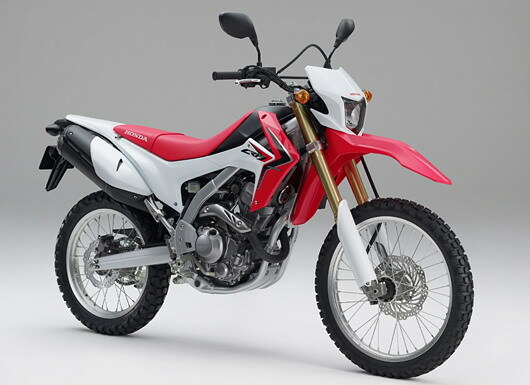 A new 2012 adventure bike from Honda. 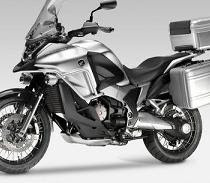 Honda enters the big adventure bike market in 2012 with the Crosstourer. 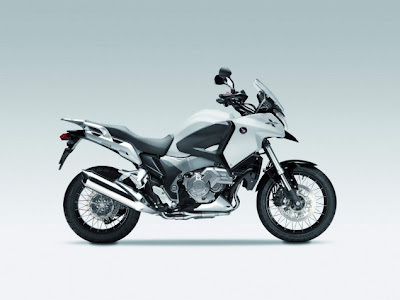 Actually dominated by the BMW 1200GS, this bike category is getting crowded with the Yamaha's Super Tenere, Ducati's MultiStrada, Triumph's Explorer, KTM's Adventure and others. Aesthetically speaking, the Crosstourer is in general, a success. 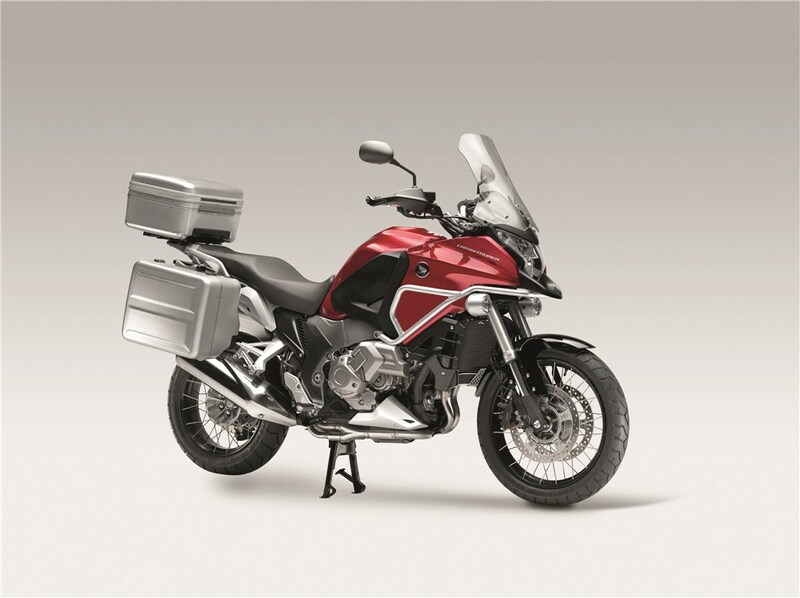 However, the front fender that recalls BMW GS style gives a bizarre allure when seen from a certain angle (Ducati's Multistrada suffers the same annoying aesthetic detail.) The following picture gives an example of that. I am a little disappointed that there is no skid plate on this second picture. Moreover, it seems the Crosstourer has skipped some weightwatcher sessions: I don't know how its 605 lbs (275 kg) could negatively affect some adventure rides I made this year. It seems in most cases this bike could pass without an issue, but in some other cases (some sections of the 6th Concession or Beaches Lake rides) the weight surplus would have been difficult to manage. In my opinion, more technical trails will need to be avoided, making me think Honda's offroad pretentions are not very high for the Crosstourer. 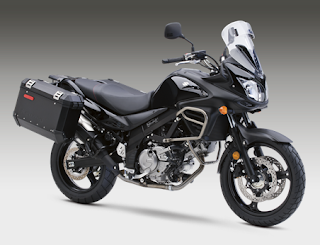 The new Crosstourer is an interesting attempt from Honda to enter the big adventure bike market. Unfortunately, this bike misses offroad potential so it will be less attractive to dual sport adventure riders. It will be interesting to watch Youtube next year (2012) to see which road types Crosstourer owners will be willing to try. I made some research and found a picture with a skid plate. Suzuki proposes a better adventure bike. +1 to Suzuki for their 650 V-Strom Adventure version. Added equipments: improved windshied with deflector; superb aluminum side cases; and crash bars. One negative point for this bike: the weight, 519 lbs (236 kilos). This is almost 100 lbs (44 kilos) more than the G650GS Sertão, a direct concurrent. In some circomstances a lighter bike makes an appreciable difference. The V-Strom 650 Adventure is only available in black, but with this great look, nobody should complaint. One last thing, ABS, that's without a doubt a great addition, especially if the bike is ridden offroad. Honda had the good idea to use the CBR250R engine to offer an improved small displacement dual-sport motorcycle compared to the CRF 230L. The CRF 250L will soon be presented to the "Tokyo Motor Show". With this new bike, Honda offers a serious competitor to the Yamaha WR250R and the KLX 250S by Kawasaki. Of course, the CRF 250L will not break any speed record on the highway but the origin of the engine indicates that it should cope reasonably well. Certainly, this bike will be very easy to maneuver in trails because of its lightness. To my humble opinion, the CRF 250L is looking pretty good. A particularly attractive version with decals and flashy paint is published on visordown.com . There is little doubt that the CRF 250L will be reliable (Honda = Japanese reliability) and it will make its owner happy for a long time as long as he does not expect too much from the on road capacity of this small bike and he is not a sumo wrestler . I would be curious to try the CRF 250L in trails I traveled so far more particularly in the rocky section from the Beaches Lake ride to test its agility. But I dread the long highway sections that I often had to overcome to go on the trails since wind protection and power on this type of bike is too limited. availability of accessories? Choice of luggage? Heated grips? weight (probably around 270 pounds / 121 kg, no complaints).